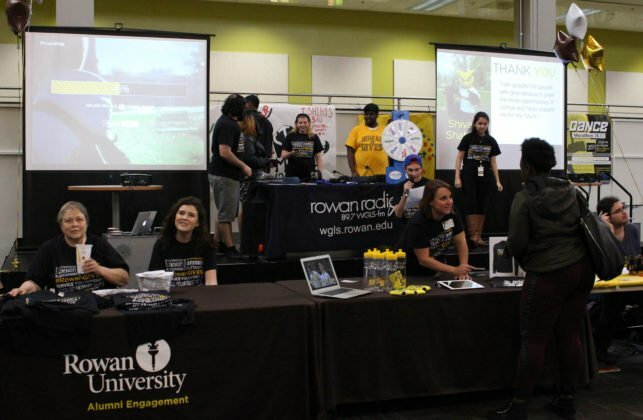 In the Chamberlain Student Center pit on Wednesday, people supporting the philanthropy of the Rowan University community came out for the third annual #RowanGIVES Day. The event is to support various funds across Rowan campuses. Students, alumni, faculty, administration, friends and family came together to donate to areas of their choosing. The student center was filled with tables, where people could go to donate to organizations such as Habitat for Humanity, Colleges Against Cancer, Back to the Boro, March of Dimes, and Mosaic Family Success Center. While the festivities happened in the pit, a 24-hour fundraising campaign was raising money online. The fundraiser was the brainchild of several campus organizations. “The Office of Alumni Engagement came up with this idea and then the Office of Volunteerism, and the leadership office all started brainstorming and came up with the model that we have now that is expanding with more donations, initiatives and challenges,” said Gary Baker, the assistant director for orientation and student leadership programs. “Rowan Gives Day is important because we want students to know how important it is to give back to the university that’s given them so much,” said Assistant Director of Alumni Engagement Jessica Kanady. If someone donated $10 or more they could bang the gong and spin the wheel to get a prize. Students were given cards to be signed at the tables and they were given t-shirts if they got it signed by three or more tables. The Mosaic Family Success Center came out to the event to promote their act of volunteering. At press time, $53,872.89 was raised by 792 donors, 79% of their goal of 1000 donors. Rowan Radio broadcasted live from the event in the pit. – Photo Editor/Amanda Palma.